This simple tomato sauce recipe is perfect for pasta, pizza, and lasagna. The secret ingredient is chopped carrots, which give the tomato sauce a fresh flavor and add a nice sweetness. Once the tomato sauce is puréed, you'll never see the carrots, but you'll definitely taste the difference. The tomato sauce recipe calls for two 28-oz. cans of whole tomatoes, but you could substitute crushed tomatoes, diced tomatoes, or tomato purée. Canned tomatoes often have a very short list of ingredients on the label, typically tomatoes, tomato juice, salt, citric acid, and calcium chloride. As you will control the rest of the ingredients, you eliminate thickeners, artificial colors, and artificial flavors. You can also often find organic canned tomatoes. You can season the tomato sauce with salt and sugar to your taste, a choice you don't get to make with canned pasta sauces. If you are reducing salt or eliminating sugar, this is an important consideration. The carrots will provide natural sweetness. In a large, heavy-bottomed saucepan, heat the olive oil for a minute over medium heat. Add the onions and carrots, and sauté for a bit until the onions are translucent but not brown. Add the tomatoes and the garlic. Bring to a simmer and cook for 30 to 45 minutes, uncovered, until the sauce is slightly reduced. If you like, you can use a wooden spoon to break up the whole tomatoes while the sauce simmers. Remove from heat and pass through a food mill, or purée in a food processor until smooth, working in batches if necessary. Season to taste with kosher salt and sugar. If you want a thicker sauce, simply continue to simmer the sauce for a longer time until it is reduced to your liking. Be careful that it doesn't scald on the bottom of the pan, however. The more it reduces, the lower the heat should be. Watch it carefully if you want it to be quite thick. This recipe keeps the sauce very simple, with no herbs added. You are free to add them to your liking. 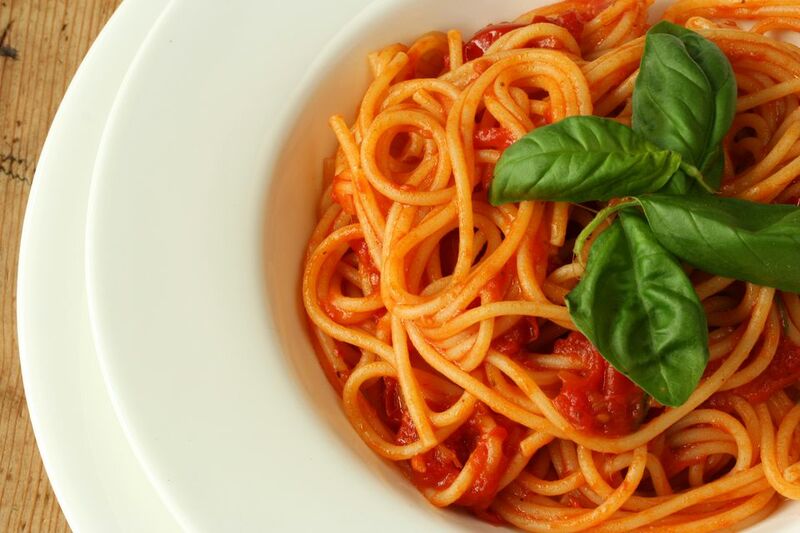 For example, basil and oregano are typical for tomato sauce for many Italian-inspired dishes. When adding herbs, do so during the last five minutes of cooking. Starting with canned tomatoes is convenient year-round. But if you grow your own tomatoes or have a source of them from the farmers market, you might use fresh tomatoes instead. If so, having a food mill is essential so you can eliminate the skins and seeds before cooking the purée.